If you didn't already know, we're on Pinterest. Yay! If you use Pinterest too, please follow us! 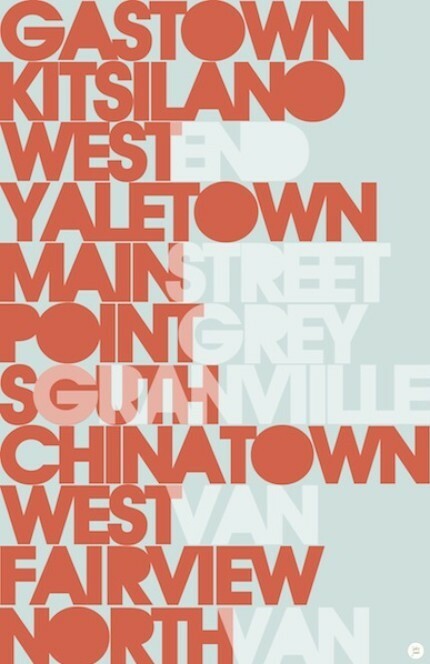 Thanks to that fun app we've come across some great Vancouver inspired artwork that we love. Check out some of our cool finds, and if you like them as well, order one for yourself! We've also pinned all these on Pinterest (as well as a few other things we love) so make sure to check them out and 'like' or 'repin' them on your own board. 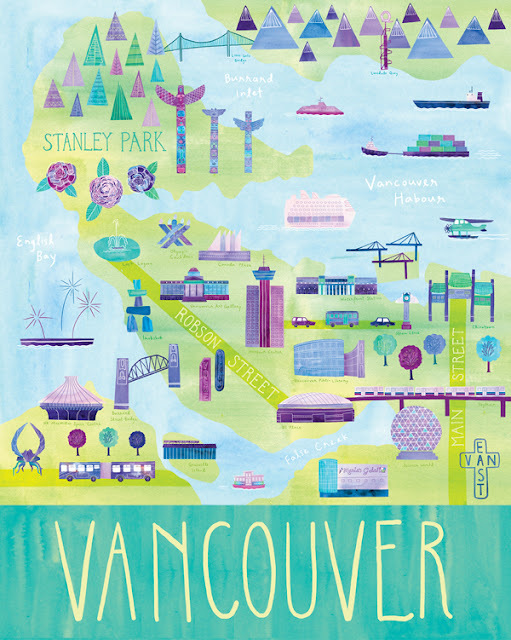 This Vancouver illustrated map was created by Marisa Sequin. Born and raised in Vancouver, she now resides in Milwaukee, WI. Like most Vancouverites she hasn't lost her love for this city, even while living abroad. This cool Vancouver is from Ork Posters. It's available in multiple color options as well as an optional screen print version. 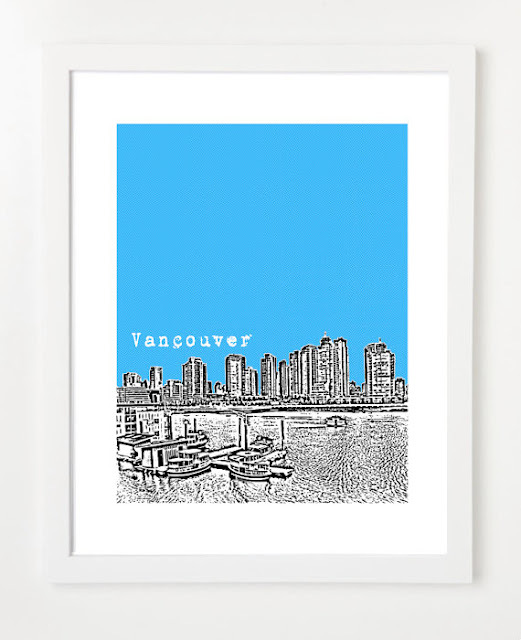 This Vancouver Skyline poster was a find off of Etsy created by BirdAve, an Edmonton based design company with roots in Vancouver. A great city view from Granville Island! BirdAve has been so kind as to give us one of these prints to pass along to a lucky contest winner, as well as give a 20% discount to any purchasers by providing the discount code "VANCOUVER" to use at checkout (valid until March 15, 2012). 1. Comment on this blog with what your favourite Vancouver community is and why. 2. Follow us on Pinerest and leave a comment on this print posted on our "things we love" board. 3. Follow us on Facebook and leave a comment about what your favourite Vancouver community is and why. Contest closes Friday, March 16th and winner will be contacted that day. This illustrated map was created by Josh Cochran. Josh grew up in Taiwan and the United States, but clearly loves Vancouver too. Have you found any great Vancouver inspired art? Songs written about our city? Design pieces? Amazing photos? Send them to us to check out, or point them out on Pinterest! We love seeing people's creative take on our city. I've lived in lots of areas of the Lower Mainland before I moved away to Edmonton, but I'd have to say my favourite area would be Killarney, just because that's where I graduated and have a ton of memories. If I could move back to Vancouver though, can't say I'd be too picky! It changes for me. I have lived here for 16 years now. My current neighbourhood crush is Gastown. I live in Burnaby, but have always been drawn to Gastown. The history, the eclectic people and the great shops and services make it a wonderful place to spend time.